Sat., December 29, 2018 5:07 p.m. | Saturday, December 29, 2018 5:07 p.m. The St. Paul Cathedral in St. Paul, Minnesota. Like dominoes falling one after another, dioceses across Minnesota declared bankruptcy in the wake of the state passing a law that gave victims of sexual assault a three-year window to file civil lawsuits regardless of when the abuse occurred. Five of the six Catholic dioceses in Minnesota, home to about 1.2 million Catholics, have turned to Chapter 11 federal bankruptcy protection to settle hundreds of claims of sexual abuse at the hands of priests. The bankruptcies will allow the dioceses to settle mounting claims of sexual abuse without going before a jury, but victims will often receive a fraction of what juries might award and strip them of their day in court. Bankruptcies don’t wipe out dioceses. They don’t dissolve them. They don’t disappear. Dioceses file for Chapter 11 bankruptcy, reorganize and emerge as leaner operations. The bankruptcies set up funds to pay victims who have filed claims of sexual abuse against the dioceses. Those victims are paid, along with other creditors who claim the diocese owes them money. The Archdiocese of St. Paul and Minneapolis was the first in Minnesota to file for bankruptcy, when it faced about two dozen lawsuits and more than 100 potential claims. It filed in January 2015, less than two years after the Minnesota legislature passed the Child Victims Act. The Diocese of Duluth followed in December 2015 when it faced a nearly $5 million verdict from a jury, six other lawsuits and about a dozen potential ones. The Diocese of New Elm filed for bankruptcy in March 2017 as it faced 101 lawsuits filed after the law changed. This month, the Diocese of Winona-Rochester filed for bankruptcy in hopes of settling 121 claims. The Diocese of St. Cloud expects to file in the coming weeks to settle 74 claims. Jury verdicts and legal fees would drain the resources of the central Minnesota diocese of about 133,000 parishioners, about the same size as the Diocese of Greensburg in Western Pennsylvania. Bishop Edward C. Malesic talks to the press before the start of the Diocese of Greensburg listening session on priest abuse at Blessed Sacrament in Greensburg, on Monday, Oct. 22, 2018. Dioceses across Pennsylvania could face bankruptcies as well, should the state legislature change statute of limitations laws to allow old claims in court. Bishop Edward Malesic, the head of the Diocese of Greensburg, wouldn’t say that he is opposed to opening a window for old claims, but did say he was against doing anything that could bankrupt his diocese. Bills that would allow adults who were victims of child sexual abuse to file civil lawsuits even though the statute of limitations in those cases have expired have failed in Harrisburg. A renewed effort at the end of the legislature’s 2018 session passed the state House by a wide margin only to stall in the state Senate. President Pro Tempore Joe Scarnati remains opposed to the measure and has endorsed victim compensation programs as an alternative. “The fear of a window is that it would limit us so much and our ministry so much that we would be crippled as a diocese,” Malesic said during an interview with the Tribune-Review last month when it announced that it was creating a victim compensation program. Nine states — California, Connecticut, Delaware, Georgia, Hawaii, Massachusetts, Michigan, Minnesota and Utah — have enacted laws that allow old claims for child sexual abuse to go to court, according to Child USA, a national nonprofit tracking changes to the statute of limitations around child sexual abuse laws and calling for states to change their laws, including the opening of windows for old claims. In addition to Minnesota, dioceses in California and Delaware have declared bankruptcy. Nearly 20 dioceses across the country have either filed for bankruptcy or announced they would file under the weight of lawsuits alleging sexual abuse by priests, according to the website www.bishop-accountability.org, which tracks clergy sexual abuse. Marci Hamilton, founder and head of Child USA said there is no doubt that diocese bankruptcies are related to opened windows. But bankruptcies for dioceses are strategic moves for diocese to limit their exposure and settle old cases. Diocese officials throughout Pennsylvania, including Pittsburgh and Greensburg, have been quick to draw a line between diocesean assets and parish assets, suggesting that parishes and schools may be held separately from other diocese properties and buildings owned by the diocese. The question of schools came up in the Archdiocese of St. Paul bankruptcy. Creditors and victims of abuse tried to lump the archdiocese’s schools and parishes into the bankruptcy, aiming for those assets as well. The archdiocese argued that the schools and parishes are independently incorporated and separate assets. A U.S. Circuit Court of Appeals agreed with the archdiocese, keeping the schools and parishes out of the bankruptcy. Dioceses that have declared bankruptcy have sold properties and laid off staff. 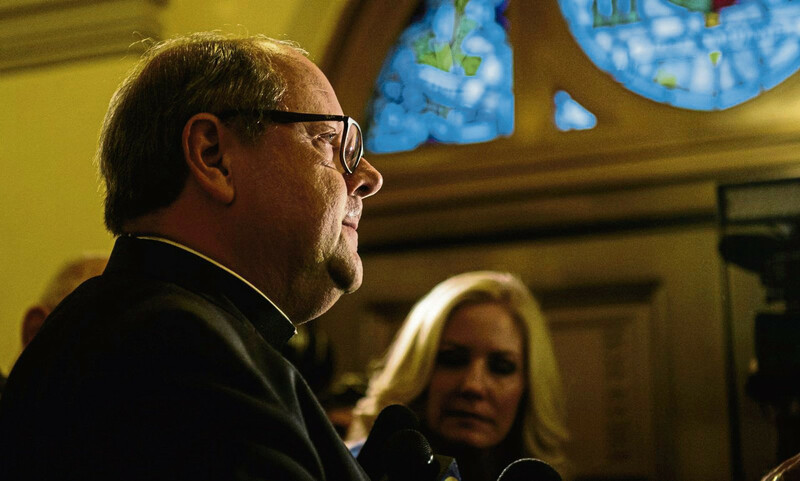 The Archdiocese of St. Paul, which has about 200,000 more parishioners than the Diocese of Pittsburgh, emerged from bankruptcy with a $210 million fund in place to settle 442 claims of sexual abuse. The archdiocese sold $9 million in properties during its bankruptcy. The Diocese of Fairbanks, Alaska, sold Pilgrim Hot Springs, a 320-acre plot of land about 40 miles north of Nome, for $1.9 million as part of its bankruptcy in 2008. The diocese set up a $9.8 million fund to settle claims by about 330 people as it emerged from bankruptcy. The Dioceses of Davenport, Iowa, which has about the same number of parishioners as the Diocese of Greensburg, filed for bankruptcy in 2006. It sold its chancery, 58 acres of adjacent land, the bishop’s house and two other homes with land for about $4 million. Services provided by the chancery were reduced as its staff was cut to 18 from 44. The Davenport dioceses established a $37 million fund through its bankruptcy to settled claims with 156 victims. But Masses continued on schedule, said Deacon David Montgomery, the chancellor and chief of staff of the diocese. And the diocese bought back its chancery and the surrounding land in 2010 after raising $3.5 million in donations.